When I originally shared the show, I left much of the interpretation of the individual paintings up to the viewer. The show itself was heavy, dealing with relationships in a digital age, through the lens of social media, and specifically, my own struggles after spending nearly a decade in an abusive relationship. Casually Indifferent was a culmination of assessing the mask I wear while looking at the why. Instead of just displaying superficial social posts, I dove deeper into my darkness simply to express how it came to be that way. Narrative and imaginative, the show was not simply about any one topic. This is an inside look at a few significant paintings and how each came to be. “You’re not like other girls” just about sums unicorns aren't real up. I am a compilation of every girl I ever met that I thought was cool. I appear to be a “cool girl” because I am apathetic and do not care if you don’t reply to my texts. I appear to be the opposite of clingy and needy, but in reality I do not feel like I have the right to be either. I associate being beautiful with privilege, and it is one I do not have. After years of being told I wasn't good/attractive/smart enough in romantic relationships, it's hard for me to believe anything else. I've lost track of the number of times a man has called me a unicorn, only to hide me away from the world, afraid to be seen with me in public. I am the dirty little secret, the woman you’re only attracted to behind closed doors. It feels okay to you, because I don’t seem to care. No man has ever bothered to ask why I don’t care, which further perpetuates my belief that I don’t have the right to demand respect because I am only beautiful when the door is closed. unicorns aren’t real is both a statement on how I don’t exist in public as a love interest and also how my “unicorn” status is merely the exterior perceived by men. Painted as a double exposure, a flickering of two selves, accompanied by a beer that flawlessly captures the moment. ICYMI, 48 x 66 in, oil on panel, 2018. Photo taken by Robert Green at 2Cream2Sugar showcase, Electric Lust. An acronym for “in case you missed it”. Utilizing a Snapchat image with the signature bar across sharing something to the world that’s only designed to be seen by one person. That image being available for only twenty-four hours with the hope that a specific human will see it, instinctively know it’s about them, and then what? Is that success? I find the idea of Snapchat funny – it has died in the same way as the images it hosts. That quick blast of vulnerability, like a shooting star, but dying before you can really get it. The Snapchat mentality is something I continually want to explore. This particular piece with the text, “I just want to forget you exist, but when I’m drunk you’re all I think of” is meant to resonate with the majority of audience members. Whether it’s an ex, a crush, or a current toxic fling, alcohol has a powerful way of bringing this person to the forefront of your mind, flooding your thoughts. Fun fact: inverting this image brings up the regular colours. This piece specifically discusses my own self-sabotage. A frequent theme of mine in order to avoid admitting, validating, or indulging in feelings and to avoid getting hurt is to sabotage a potential relationship prior to it getting off the ground. You can’t get hurt if there’s no chance of a beginning. As Jaik Puppyteeth says, “a freshly hatched dead end romance”. Running from your feelings into the arms of another is not only escapist, but often appears much easier than facing them head on. The recognition of this attribute of myself during the creation of the series instantly made this piece my favourite. It resonates with the darkest parts of my heart more than any other. If I can make a man hate me before he realizes I love him, then I never face rejection for any reason other than having hurt him. Flawed logic, and perhaps the most honest of any piece. Title taken from a meme, bae said with sarcasm, throwback to Gone With the Wind. Created in relation to self-love, something I am working on and slowly. The idea that it shouldn’t matter what someone else thinks about you or your body. 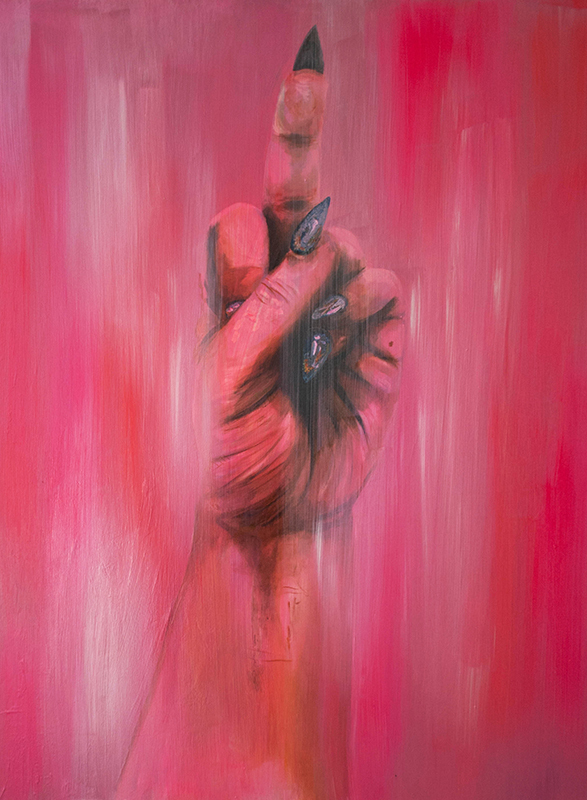 The POV of the hand puts the viewer in the position as the person giving someone the finger as opposed to the other way around. It is the response I so regularly want to give to the strangers that feel the need to tell me how unhealthy I am. It is the response I want to give to the men who catcall me, and the women who comment on my weight. It is the response I want to give to any unsolicited commentary on my appearance. Bae, the slang pet name “before anyone else” brings to mind someone who thinks they are important enough to voice the opinion in the first place. I also want to give this response to my own insecurities which often drown out logic. things left unsaid (i, ii, iii, & iv), 25 x 25 in each, oil on panel, 2018. Photo taken by Robert Green at 2Cream2Sugar showcase, Electric Lust. Everyone’s favourite to decipher, things left unsaid is a four part piece dealing with modern relationships, the impact of technology, and an inability to communicate emotions. Have you ever reread a text conversation and wish you could write it differently? Imagined the things you should have said? Could have, but didn’t? I have. I purposely delete my text messages to avoid obsessive analytical behaviour. Meant to be arranged in any order that doesn’t necessarily have to make sense, things left unsaid prompts the viewer to question what was said, what wasn’t, is it real, is it made up, and furthermore, who is saying what? Here’s a clue: none of these conversations originally happened in text format. They are a combination of four different moments with four different people. They all happened in person. I redacted each conversation and added additional phrases that are imagined. These works are both too close to reality for comfort and at the same time, entirely absurd and fictional. Things were not said as they are laid out. Much has been left unsaid. Every single message has been edited to some extent. While anyone could recognize a part of themselves in a message, there is no direct correlation between the work and any single human. And yes, I will be making more text conversations.